Following a first round technical knockout loss to Alistair Overeem at UFC 141 last night, Brock Lesnar officially retired from mixed martial arts. "My hats off to Alistair Overeem," Lesnar said afterwards. "I've had a really difficult couple of years with my disease. Tonight was the last time you'll see me in the Octagon. I promised my wife and kids if I won tonight I'd fight one more time for the title, and if I lost I'd retire." After battling diverticulitis for the past few years, Lesnar struggled in his past few bouts. He lost the heavyweight title to Cain Velasquez before having a foot of his intestines removed back in May. Lesnar told Joe Rogan in the post-fight interview that he had been planning his exit from MMA for a while. Had he beat Overeem, he would have attempted to win the heavyweight championship one more time against Junior dos Santos, and that would have been his final bout. 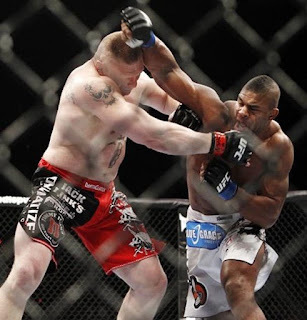 Instead, it will be Overeem who gets the next shot at Santos.